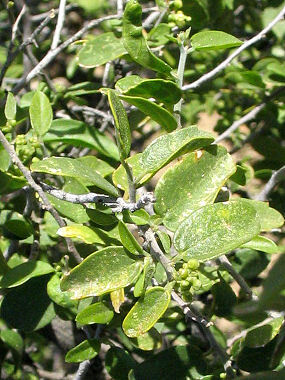 Desert Hackberry is a member of the Elm Family. The plant appears as a spiny evergreen shrub and grows to 20 feet in height. Leaves are dark green and elliptical to oval and grow on alternate sides of the stem to 1.5 inches in length. The plant typically grows in washes canyons and in open desert at elevations between 1500 - 3500 feet. The sharp spines of the Desert Hackberry can reach 1 inch in length. Desert Hackberry blooms in the summer and produces tiny whitish flowers to 1/16 inches wide followed by a twin or single green egg-shaped berry to 0.25 inches in length.